Many food lovers will be hunting down the culinary hot shots of Ireland as they tour the country on their summer vacations, heading to great new places like Westport's The Idle Wall and Dingle's idas, just two of the hot spots we have covered in previous editions of Megabites. This time, however, we want to let you in on ten little holiday secrets, lesser-known rooms, from little bakeries to quiet cafés, whose food will delight you. All of them are special, and will make your travels memorable. “Pollock parsley stew, black kale, new potatoes, oyster mushrooms, furikake”. There you have it: a single dish that explains why Pilgrims, a smart room in the centre of postcard-pretty Rosscarbery, is the talk of West Cork. Look at that line-up of ingredients, of influences, of understanding, and you know why Mark Jenning's food has got people chattering, and why you should be making a holiday beeline to let Mark and Sarah Jane Pearce look after you. “An exciting young team”, said Darina Allen. That will do nicely, as will a plate of strawberry, chicory, strained yogurt, cobnuts and rhubarb vinaigrette. Look at it: that is a toasted ham and cheese sandwich in a panini. But this is no ordinary toastie, and for a simple reason: Billy the Baker, of Union Hall's The Coffee Shop, baked that panini freshly this morning, so this is the best toastie you are going to get in West Cork this summer. Imagine: a real panini, baked by a real baker, in this light-filled, cheerful room in the centre of this glorious village. Could life be sweeter? The answer is yes: it gets sweeter the minute you order that strawberry cheesecake for pudding, and discover that Billy the Baker can do this patisserie just as well as the savoury stuff. Jessie and Billy (pictured right) are operating a wee beauty of a destination here: don't miss it. Dan and Emily O'Brien don't have a great room to work with in Daroka, but it doesn't matter a bit: you are here in Ballybunnion in north County Kerry for the food Mr O'Brien puts on the plate and for the plate that Mrs O'Brien then puts on the table in front of you and, if they served this food in a Nissen hut, that would be just fine. Dan O'Brien is a great modern Irish chef, and he has a secret up his sleeve: the produce from his own and others gardens and polytunnels. These summer foods make his plates sing with flavour, and this great chef brings it all home with gas in the tank. “Serving superb seafood, including a brilliant crab quiche”, was the happy report of our man Eugene when it came to singling out the special style of Caroline Danaher's food in Dingle's engaging and modest The Boatyard. Ms Danaher loves to make a feature of the Dingle seafood, for it also features on her Taste of Dingle Bay Crab plate, which showcases the beautiful sweet salinity of this stupendous food, and don't miss her roulade of Dover sole with salmon, which showcases the peninsula's best ingredients. George and Shony's gorgeous little room on the pier at Portrush is where you want to be for the most concise, most well-chosen and best thought-through menu on the Causeway Coast. Superb breads from Ursa Minor bakery underpin their classics like the Bulgogi burger; the marinated chicken on flatbread; the grilled halloumi on sourdough; and their fantastic breakfasts and their wizard confections with salted caramel are worth the trip to Portrush. Lovely room, superb service, bring on the sunshine. 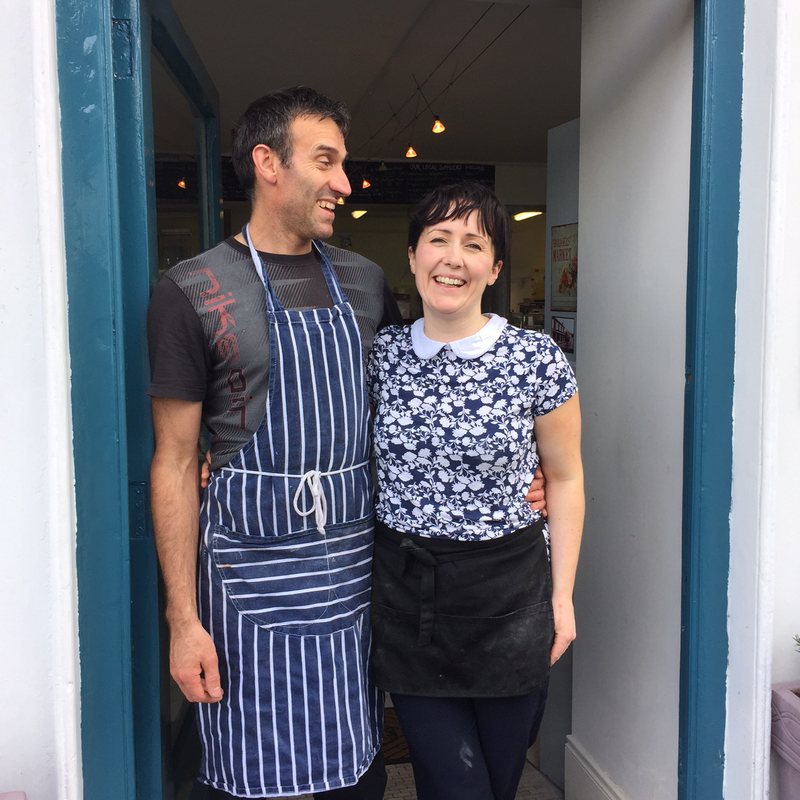 There is some special cooking going on in The Hungry Monk, one of the best-known destinations in the gorgeous village of Cong, now under the command of Jonathan and Aisling Byrne. If you want to know where they are at, just take a look at the blackboard and, especially, zero in on “A Salad of Lovely Things: Honey roast bacon; hen's egg; Coolattin cheddar; mixed leaves; mustard mayo; and brown bread.” Man, that's how you make a salad: a collation of lovely things with Coolattin, gathered from great producers – and from their own polytunnel – plated with elegance and served with charm. But the Hungry Monk is also a wanderer, so there might be a Basque-stytle chorizo stew with john dory, or teriyaki pork belly served on a Waterford blaa, or New York-style salt beef that is brined in-house, then served with jalapenos and sauté potatoes. Jonathan and Aisling are hungry travellers who have worked in Tokyo, London and Boston, and their hunger to learn has been brought to tasty fruition in this gorgeous room. How could anyone resist a drink called “Wisdom Ale”? And if there is a wood-grilled t-bone steak with smoked bearnise butter to eat with your glass of Wisdom Ale, then how bad is that? Conrad Howard is rewriting the book here in Cork's Elbow Lane. For a start, it's both a brewhouse and smokehouse, home to their quintet of Elbow Lane craft beers, and home to some smart smoking and cooking. Mr Howard has taken the lessons from their successful Market Lane restaurant, and has amped up the food offer with the sort of dishes you might expect in Manhattan, but which come as a delicious surprise in Cork: smoked poussin with bulgogi sauce; baby back ribs with house sauce; brisket roll with rojak sauce; blood pudding with burnt egg yolk; ox cheek stew on potato purée. The room is small – space for 25 people – and it is pure gorgeous. Mr Howard and his team are blazing a bright new trail in Cork city. The problem with Orso is simple: it's hard to get a table. Conrad Howard's calm and confident restaurant formula works perfectly in this little room, and perhaps the secret is that everything looks so appealing: you walk in the door, look at the delicious things prepped to eat, ask for a table, and promptly die of disappointment when you realise the place is already full. “Twenty minutes”, they say, but that's optimistic: no one wants to leave the comfort of Orso, and the delight of Middle Eastern-influenced food which one writer described as “like a comforting hug...” Bring on the stuffed roast aubergines, the legendary sausage roll, the speck salad, the boneless lamb rib in sesame crust. Harry O'Neill and Kamila Bystrzonowska had been working around the restaurant scene in Waterford for a few years before they ended up working together in Waterford’s seminal bar, Geoff's, on Michael Street. The germ of Momo was probably sown there and then they met chef Ronan Joy, who has worked with Kevin Aherne in Sage, in Midleton. Together this team have applied a single minded focus on sourcing, seasonality and great cooking. Look out for monkfish roasted with a dehydrated black olive crust, served on a great tasting bacon and fennel risotto; homemade fish fingers with Duncannon Smokehouse salmon filled with cream cheese, dill and Doherty’s smoked cod; crispy shoulder of spring lamb with cumin spiced potatoes. This is an exciting and exacting approach and shows great confidence and surety of vision from this team. Christophe's little bakery is on the ground floor of the smashing Lyon's department store, in the centre of Sligo town. Now, Lyon's has, of course, been famous as the home to Gary Stafford's Lyon's Café, scene of some of the smartest cooking in the town for many years now. But the addition of this invaluable bakery, with its amazing cornbread sandwiches and killer patisserie, has made Lyons into a Bang Bang destination: upstairs for superb modern Irish food, downstairs for some of the best sweet baking on the west coast.